Through the public facebook group Scritti Politti – Share the Love i discovered this video Scritti Politti Unplugged – Brooklin, 2006 by Tiziano Sossi. The first time i ever saw this video. As this text is saying, this video was only copied to youtube on May 30 2016. This might be not true, it could be a re-upload. But you never know. 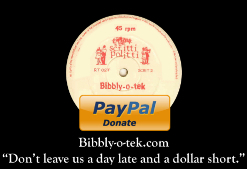 Bibbly-o-tek was offline for a week and a half. We discussed the hosting of this site, which was up for another yearly payment. Me, Ellen, offered to move the site to my personal hosting plan at Mediatemple. I still had enough room there to host the site. I didn’t want to see bibbly-o-tek go. The other maintainers of this currently quiet website happily agreed with me. It took some time to move the domain to Mediatemple. Today that was finally done. I had forgotten to make a backup of the database, but i could make one at the old hosting company. Right now i’m moving all the files, the audio files and video files. And the template. I will do some work on this website. I will change the template. The current one is made in 2006, before mobiles took over the internet. So that is the first thing i will change. Then there will be the long grueling grind of updating the video’s, most in flash flv format. The whole process will take some time. Most should be done by the end of this week. Updating the video’s will take a bit longer. Here is a link to Adrian Colley complete blog! We received a heads-up email from Richard Barret about Adrian Colley blog via email last week! Thanks for passing on the info to us Richard and thanks to Adrian for writing the article and posting the media!